Paleontology (palaeontology or palæontology) is the scientific study of life forms that existed in the earth's distant past as revealed though the examination of fossils of plants, animals, and other organisms. Included is the study of body fossils, tracks (ichnites), burrows, cast-off parts, fossilized feces (coprolites), palynomorphs (tiny organic particle of a size between five and 500 micrometers), and chemical residues. Paleontology represents the desire of human beings to better understand the history of life on Earth, and in so doing to better understand themselves and the world around them, including fundamental principles governing changes. Knight and Schlager (2002) noted that if the entire history of Earth were likened to a single year of 365.25 days, the Homo genus would not come on the scene until December 31 around 8:00 pm, human civilization would begin at 42 seconds before midnight, and Christ's birth would have occurred at about 14 seconds before the New Year. Human beings are thus the culmination of a long process. Modern paleontology sets prehistoric life in its contexts by studying how long-term physical changes of global geography (paleogeography)and climate (paleoclimatology) have affected the history of life, how ecosystems have responded to these changes and have changed the planetary environment in turn, and how these mutual responses have affected today's patterns of biodiversity. Hence, paleontology overlaps with geology (the study of rocks and rock formations) as well as with botany, biology, zoology, and ecology. The major subdivisions of paleontology include paleozoology (animals), paleobotany (plants), and micropaleontology (microfossils). Paleozoologists may specialize in invertebrate paleontology, which deals with animals without backbones or in vertebrate paleontology, dealing with fossils of animals with backbones, including fossil hominids (paleoanthropology). Micropaleontologists study microscopic fossils, including organic-walled microfossils (palynomorphs) whose study is called palynology. There are many related specialties such as paleobiology, paleoecology, ichnology (the study of tracks and burrows), and taphonomy (the study of what happens to organisms after they expire). Major areas of study include the correlation of rock strata with their geologic ages and the study of the evolution of lifeforms. Paleontology utilizes the same classic binomial nomenclature scheme, devised for the biology of living things by the mid-eighteenth century Swedish biologist Carolus Linnaeus and increasingly sets these species in a genealogical framework, showing their degrees of interrelatedness using the still somewhat controversial technique of 'cladistics'. The primary economic importance of paleontology lies in the use of fossils to determine the age and nature of the rocks that contain them or the layers above or below. This information is vital to the mining industry and especially the petroleum industry. Simply looking at the fossils contained in a rock remains one of the fastest and most accurate means of telling how old that rock is. Fossils were known by ancestral humans and were sometimes identified correctly as the remains of ancient lifeforms. The organized study of paleontology dates from the late eighteenth century. Paleobotany. Paleobotany is the branch of paleontology dealing with the recovery and identification of plant remains from geological contexts, and their place in the reconstruction of past environments and the history of life. Paleobotany includes the study of terrestrial plant fossils as well as the study of marine autotrophs, such as algae. A closely related field to paleobotany is palynology, the study of fossil and extant spores and pollen. Paleozoology. Paleozoology is the branch of paleontology dealing with the recovery and identification of multicellular animal remains and the use of these fossils in the reconstruction of prehistoric environments and ancient ecosystems. Definitive, macroscopic remains of these metazoans are found in the fossil record from just before the Cambrian period onwards, although they do not become common until the Late Devonian period in the latter half of the Paleozoic era. Vertebrate teeth, invertebrate shells, and other hard organic parts are the most commonly preserved and found animal fossils. Exclusively soft-bodied animals—such as jellyfish, flatworms, nematodes, and insects—are consequently rarely fossilized. Paleoecology. Paleoecology uses data from fossils and subfossils to reconstruct the ecosystems of the past. It includes the study of fossil organisms in terms of their life cycle, their living interactions, their natural environment, their manner of death, and their burial. Paleoecology's aim is therefore to build the most detailed model possible of the life environment of those living organisms that are found today as fossils; such reconstruction work involves complex interactions among environmental factors (temperature, food supplies, degree of solar illumination, etc.). Of course, much of this complex data has been distorted or destroyed by the postmortem fossilization processes, adding another layer of complexity. Paleobiology. Paleobiology is a growing and comparatively new discipline that combines the methods and findings of the natural science biology with the methods and findings of paleontology. Typical paleobiological research attempts to answer biological questions using geological objects such as fossils found in the field. Both macrofossils and microfossils are typically analyzed, although the twenty-first century genetic analysis of DNA and RNA samples offers much promise. Micropaleontology. 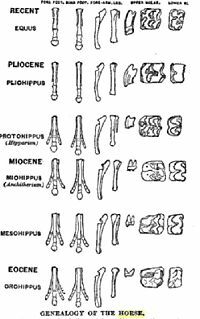 Micropaleontology is the branch of paleontology that studies microfossils. Microfossils are fossils generally not larger than four millimeters, and commonly smaller than one millimeter, the study of which requires the use of light or electron microscopy. Fossils that can be studied with the naked eye or low-powered magnification, such as a hand lens, are referred to as macrofossils. Obviously, it can be hard to decide whether or not some organisms should be considered microfossils, and so there is no fixed-size boundary. Microfossils are a common feature of the geological record from the Precambrian to the Holocene. While every kingdom of life is represented in the microfossil record, the most abundant forms are protist skeletons or cysts from the Chrysophyta, Pyrrhophyta, Sarcodina, acritarchs, and chitinozoans, together with pollen and spores from the vascular plants. Micropaleontology can be roughly divided into four areas of study on the basis of microfossil composition: (a) calcareous, as in coccoliths and foraminifera, (b) phosphatic, as in the study of some vertebrates, (c) siliceous, as in diatoms and radiolaria, or (d) organic, as in the pollen and spores studied in palynology. Palynology. Palynology is the science that studies contemporary and fossil palynomorphs; that is, particles of a size between five and 500 micrometres, found in rock deposits, and composed of organic material. Such palynomorphs studied include pollen, spores, dinoflagellate cysts, acritarchs, chitinozoans, and scolecodonts, together with particulate organic matter (POM) and kerogen found in sedimentary rocks and sediments. Ichnology. Ichnology is the branch of paleontology that deals with traces of organism behavior. The division of ichnology dealing with trace fossils is paleoichnology, while neoichnology is the study of modern traces. Parallels can often be drawn between modern traces and trace fossils, helping scientists to decode the possible behavior and anatomy of the trace-making organisms even if no body fossils can be found. Ichnologic studies are based on the discovery and analysis of biogenic structures: features caused by a living organism. Thus, burrows, tracks, trails and borings are all examples of biogenic structures, but not casts or molds of dead shells or other bodily remains. History includes a number of prominent paleontologists. Charles Darwin collected fossils of South American mammals during his trip on HMS Beagle and examined petrified forests in Patagonia. Mary Anning was a notable early paleontologist. She found several landmark fossils in her home town of Lyme Regis in England. Although self-taught, she collected and described them in a very systematic way. William Buckland, Richard Owen, Gideon Mantell, Georges Cuvier, and Thomas Huxley were important early pioneers, in the field of paleontology. Thomas Jefferson took a keen interest in mammoth bones. Edward Drinker Cope and Othniel Charles Marsh waged a famously fierce competition known as the Bone Wars in the late nineteenth century that involved some questionable practices, but which significantly advanced the understanding of the natural history of North America and vertebrate paleontology. Besides looking at mammal teeth and unearthing penguin skeletons, George Gaylord Simpson played a crucial role in bringing together ideas from biology, paleontology and genetics, to help create the "Modern Synthesis" of evolutionary biology. His book, Tempo and Mode is a classic in the field. Prominent names in invertebrate paleontology include Steven Stanley, Stephen Jay Gould, David Raup, and Jack Sepkoski, who have done much to expand the understanding of long-term patterns in the evolution of life on earth. Large names in the field of paleoanthropology include Louis, Mary, and Richard Leakey, Raymond Dart, Robert Broom, Kenneth Oakley, Robert Ardrey, and Donald Johanson. In recent times, Mongolian paleontologist Rinchen Barsbold has done much to expand our understanding of dinosaur and bird evolution. The use of fossils in understanding the distant past has been extensive throughout history and traces back to at least the sixth century B.C.E., when Xenophanes of Colophon recognized that some fossil shells were remains of shellfish, and used this to argue that what was now dry land was once under the sea. It is well known that in one of his unpublished notebooks, Leonardo da Vinci (1452-1519) also concluded that some fossil sea shells were the remains of shellfish. However in both these cases, it is clear that the fossils were relatively complete remains of shellfish species that very closely resembled living species. Thus they were relatively easy to classify (Rudwick 1972). As late as the sixteenth century, there was still little recognition that fossils were remains of living organisms. The etymology of the word fossil comes from the Latin for things having been dug up. As this indicates, the term was applied to wide variety of stone and stone-like objects without regard to whether they might have an organic origin. One reason that the possibility that fossils might be actual remains of once living organisms was not more widely considered, was that the natural philosophy of the period encouraged alternative explanations. Both the Aristotelian and Neoplatonic schools of philosophy provided intellectual frameworks where it was reasonable to believe that stony objects might grow within the earth to resemble living things. Neoplatonic philosophy maintained that there could be affinities between living and non living objects that could cause one to resemble the other. The Aristotelian school maintained that it was possible for the seeds of living organisms to enter the ground and generate objects that resembled those organisms (Rudwick 1972). The seventeenth century, often referred to as the Age of Reason, saw fundamental changes in natural philosophy that were reflected in the analysis of fossils. In 1665, Robert Hooke published Micrographia, an illustrated collection of his observations with a microscope. One of these observations was titled Of Petrify'd wood, and other Petrify'd bodies, which included a comparison between petrified wood and ordinary wood. He concluded that petrified wood was ordinary wood that had been soaked with "water impregnated with stony and earthy particles." He then went on to suggest that several kinds of fossil sea shells were formed from ordinary shells by a similar process. He argued against the prevalent view that such objects were "Stones form'd by some extraordinary Plastick virtue latent in the Earth itself" (Hooke 1665). 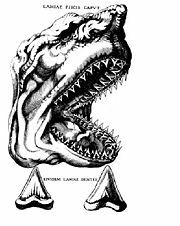 In 1667, Nicholas Steno wrote a paper on a large shark head he had dissected the year before, in which he compared the teeth of the shark with the common fossil objects known as tongue stones. He concluded that the fossils must have been shark teeth. This caused Steno to take an interest in the question of fossils and to address some of the objections that were raised against their organic origin. As a result, he did some geological research and in 1669 published Forerunner to a Dissertation on a solid naturally enclosed in a solid. In that work, Steno drew a clear distinction between objects such as rock crystals that really were formed within rocks and objects such as fossil shells and shark teeth that were formed outside of the rocks they were found in. Steno realized that certain kinds of rock had been formed by the successive deposition of horizontal layers of sediment and that fossils were the remains of living organisms that had become buried in that sediment. Steno who, like almost all seventeenth century natural philosophers, believed that the earth was only a few thousand years old, resorted to the Biblical flood as a possible explanation for fossils of marine organisms that were found very far from the sea (Rudwick 1972). Despite the considerable influence of Forerunner, naturalists such as Martin Lister (1638-1712) and John Ray (1627-1705) continued to question the organic origin of some fossils. They were particularly concerned about objects such as fossil ammonites, which Hooke had claimed were organic in origin, which did not closely resemble any known living species. This raised the possibility of extinction, which they found difficult to accept for philosophical and theological reasons (Rudwick 1972). no real species of living creatures is so utterly extinct, as to be lost entirely out of the World, since it was first created, is the opinion of many naturalists; and 'tis grounded on so good a principle of Providence taking care in general of all its animal productions, that it deserves our assent (Waggoner 1996). In his 1778 work Epochs of Nature, Georges Buffon referred to fossils, in particular the discovery of what he thought of as fossils of tropical species such as the elephant and rhinoceros in northern Europe, as evidence for the theory that the earth had started out much warmer than it currently was and had been gradually cooling. In 1796, Georges Cuvier presented a paper on living and fossil elephants, in which he used comparative anatomy to analyze skeletal remains of Indian and African elephants, mammoth fossils, and fossil remains of an animal recently found in North America that he would later name mastodon. He established for the first time that Indian and African elephants were different species, and even more importantly that mammoths had been a different species from either and therefore must be extinct. He further concluded that the mastodon must be another extinct species that was even more different from Indian or African elephants than mammoths had been. Cuvier’s ground breaking work in paleontology and comparative anatomy lead to the wide spread acceptance of the reality of extinction (McGowan 2001). It also lead Cuvier to advocate the geological theory of catastrophism to explain the succession of living things revealed by the fossil record. Cuvier also pointed out that since mammoths and wooly rhinoceroses were not the same species as the elephants and rhinoceroses currently living in the tropics, their fossils could not be used as evidence for a cooling earth. Cuvier made another powerful demonstration of the power of comparative anatomy in paleontologhy when he presented a second paper in 1796 on a large fossil skeleton from Paraguay, which he named Megatherium and identified as a giant sloth by comparing its skull to those of two living species of tree sloth. In a pioneering application of stratigraphy, the study of the layering of rocks, William Smith, a surveyor and mining engineer, made extensive use of fossils to help correlate rock strata in different locations as he worked on the first geological map of England during the late 1790s and early 1800s. In the process, he established the principle of faunal succession, the idea that each strata of sedimentary rock would contain particular types of fossils, and that these would succeed one another in a predictable way even in widely separated geologic formations. Cuvier and Alexandre Brongniart, an instructor at the Paris school of mine engineering, used similar methods during the same period in an influential study of the geology of the region around Paris. Cuvier in 1808 identified a fossil found in Maastricht as a giant marine reptile that he named Mosasaurus. 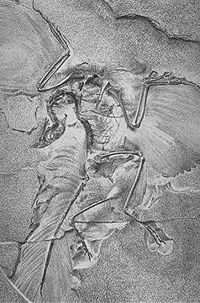 He also identified, from a drawing, another fossil found in Bavaria as a flying reptile and named it Pterodactylus. He speculated that an age of reptiles had preceded the first mammals (Rudwick 1997). Cuvier's speculation would be supported by a series of spectacular finds that would be made in Great Britain over the course of the next couple of decades. Mary Anning, a professional fossil collector since age 11, collected the fossils of a number of marine reptiles from the Jurassic marine strata at Lyme Regis. These included the first ichthyosaur skeleton to be recognized as such, which was collected in 1811, and the first plesiosaur collected in 1821. Many of her discoveries would be described scientifically by the geologists William Conybeare, Henry De la Beche, and William Buckland (McGowan 2001). In 1824, Buckland found and described a lower jaw from Jurassic deposits from Stonesfield. He deemed the bone to have belonged to a giant carnivorous land dwelling reptile he called Megalosaurus. That same year Gideon Mantell realized that some large teeth he had found in 1822, in Cretaceous rocks from Tilgate, belonged to a giant herbivorous land dwelling reptile. He called it Iguanodon, because the teeth resembled those of an iguana. In 1832. Mantell would find a partial skeleton of an armored reptile he would call Hylaeosaurus in Tilgate. In 1842, the English anatomist Richard Owen would create a new order of reptiles, that he called Dinosauria for Megalosaurus, Iguanodon, and Hylaeosaurus (McGowan 2001). This growing evidence that an age of giant reptiles had preceded the age of mammals caused great excitement in scientific circles, and even among some segments of the general public (McGowan 2001). 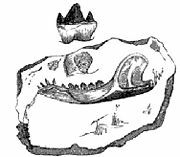 Buckland did describe the jaw of a small primitive mammal, Phascolotherium, that was found in the same strata as Megalosaurus. This discovery, known as the Stonesfield mammal, was a much discussed anomaly. Cuvier at first thought it was a marsupial, but Buckland later realized it was a primitive placental mammal. Due to its small size and primitive nature, Buckland did not believe it invalidated the overall pattern of an age of reptiles preceding the age of mammals (McGowan 2001). Fossil plants were also being discovered early in the nineteenth century. 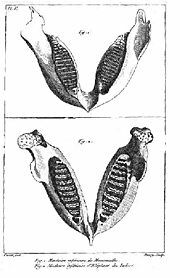 In 1828, Alexandre Brongniart's son, the botanist Adolphe Brongniart published the introduction to a longer work on the history of fossil plants. Brongniart concluded that the history of plants could roughly be divided into four parts. The first period was characterized by cryptogams. The second period was characterized by the appearance of the first conifers. The third period saw the emergence of the cycads, and the forth by the emergence of the flowering plants (such as the dicotyledons). The transitions between each of these periods was marked by sharp discontinuities in the fossil record and more gradual changes within each of the periods. Besides being foundational to paleobotany, Brongniart's work strongly reinforced the impression that was emerging from both vertebrate and invertebrate paleontology that life on earth had a progressive history with different groups of plants and animals making their appearances in some kind of successive order (Rudwick 1997). In Cuvier's landmark 1796 paper on living and fossil elephants, he referred to a single catastrophe that had wiped out a world of life that had existed before the current one. However, as he continued his work on extinct mammals, he came to realize that animals such as Palaeotherium had lived before the time of the Mammoths and the rest of the fauna that had coexisted with them, and this lead him to write in terms of multiple geological catastrophes, which had wiped out a series of successive faunas (Rudwick 1997). Reinforced by paleobotany, and the dinosaur and marine reptile discoveries in Britain, this view had become the scientific consensus by about 1830 (Rudwick 1997). However, in Great Britain, where natural theology was very influential in the early nineteenth century, a group of geologists that included Buckland and Robert Jameson insisted in explicitly linking the most recent of Cuvier's catastrophes to the biblical flood. This gave the discussion of catastrophism a religious overtone in Britain that was absent elsewhere (Rudwick 1997). Partly in response to what he saw as unsound and unscientific speculations by William Buckland and other practitioners of flood geology, Charles Lyell advocated the geological theory of uniformitarianism in his influential work Principles of Geology (McGowan 2001). Lyell amassed a tremendous amount of evidence both from his own field research and the work of others that showed that rather than depending on past catastrophes, most geological features could be better explained by the slow action of present day forces, such as volcanism, earthquakes, erosion, and sedimentation (McGowan 2001). Lyell also claimed that the apparent evidence for catastrophic changes from the fossil record, and even the appearance of progression in the history of life, were illusions caused by imperfections in that record (McGowan 2001). As evidence, Lyell pointed to the Stonesfield mammal, and to the fact that certain Pleistocene strata showed a mixture of extinct and still surviving species (Rudwick 1997). Lyell had significant success in convincing geologists of the idea that the geological features of the earth were largely due to the action of the same geologic forces that could be observed in the present day acting over an extended period of time. However, he was much less successful in converting people to his view of the fossil record, which he claimed showed no true progression (McGowan 2001). Geologists such as Adam Sedgwick and Roderick Murchison continued, despite some contentious disputes, making great advances in stratigraphy as they described new geological epochs such as the Cambrian, the Silurian, the Devonian, and the Permian. By the early 1840s, much of the geologic timescale had taken shape. All three of the periods of the Mesozoic era and all the periods of the Paleozoic era except the Ordovician had been defined (Rudwick 1972). It remained a relative time scale with no method of assigning any of the periods absolute dates. It was understood that not only had there been an age of reptiles preceding the age of mammals, but there had a time (during the Cambrian and the Silurian) when life had been restricted to the sea, and a time (prior to the Devonian) when invertebrates had been the dominant form of animal life. Charles Darwin's publication of the Origin of Species in 1859 was a watershed event in paleontology. The scientific debate that started immediately after the publication of Origin led to a concerted effort to look for transitional fossils and other evidence of descent with modification in the fossil record. There were two areas where early success attracted considerable public attention, the transition between reptiles and birds, and the evolution of the modern single toed horse (Larson 2004). In 1861, the first specimen of Archaeopteryx, an animal with both teeth and feathers and a mix of other reptilian and avian features, was discovered in a limestone quarry in Bavaria and would be described by Richard Owen. Another would be found in the late 1870s and put on display at a Museum in Berlin in 1881. Other primitive toothed birds were found by Othniel Marsh in Kansas in 1872. Marsh also discovered fossils of several primitive horses in the Western United States that helped trace the evolution of the horse from the small 5 toed Hyracotherium of the Eocene to the much larger single toed modern horses of the genus Equus. Thomas Huxley would make extensive use of both the horse and bird fossils in his advocacy for evolution. Diagram by O.C. 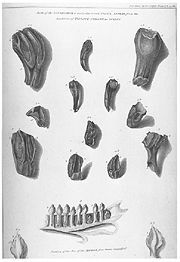 Marsh of the evolution of horse feet and teeth over time as reproduced in T.H Huxley's 1876 book Professor Huxley in America. The 2nd half of the nineteenth century saw a rapid expansion of paleontology in North America. In 1858, Joseph Leidy described a Hadrosaurus skeleton, which was the first North American dinosaur to be described from good remains. However, it was the massive westward expansion of railroads, military bases, and settlements into Kansas and other parts of the Western United States following the American Civil War that really fueled the expansion of fossil collection (Everhart 2005). The result was an increased understanding of the natural history of North America, including the discovery of the Western Interior Sea that had covered Kansas and much of the rest of the Midwestern United States during parts of the Cretaceous, the discovery of several important fossils of primitive birds and horses, and the discovery of a number of new dinosaur species including Allosaurus, Stegosaurus, and Triceratops. Much of this activity was part of a fierce personal and professional rivalry between two men, Othniel Marsh, and Edward Cope, which has become known as the Bone Wars. Two twentieth century developments in geology had a big effect on paleontology. The first was the development of radiometric dating, which allowed absolute dates to be assigned to the geologic timescale. The second was the theory of plate tectonics, which helped make sense of the geographical distribution of ancient life. The twentieth century saw a major renewal of interest in mass extinction events and their effect on the course of the history of life. This was particularly true after 1980 when Luis and Walter Alvarez put forward the Alvarez hypothesis, claiming that an impact event caused the Cretaceous-Tertiary extinction event, which killed off the dinosaurs along with many other living things. Throughout the twentieth century new fossil finds continued to contribute to understanding the paths taken by evolution (specifically the theory of descent with modification). Examples include major taxonomic transitions such as finds in Greenland, starting in the 1930s with more major finds in the 1980s, of fossils illustrating the possible descent of tetrapods from fish, as well as finds in China during the 1990s that shed light on the dinosaur-bird connection. 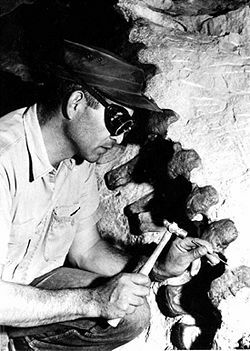 Other events that have attracted considerable attention have included a series of finds in Pakistan that have helped illuminate the origin of whales, and most famously of all a series of finds throughout the twentieth century in Africa (starting with Taung child in 1924) and elsewhere have helped articulate the course of human evolution. Increasingly, at the end of the century the results of paleontology and molecular biology were being correlated to reveal phylogenic trees. The results of paleontology have also contributed to other areas of evolutionary theory such as the theory of punctuated equilibrium. One area of paleontology that has seen a lot of activity during the 1980s, 1990s and beyond is the study of the Cambrian explosion during which the various phyla of animals with their distinctive body plans first appear. The well known Burgess Shale Cambrian fossil site was found in 1909 by Charles Doolittle Walcott, and another important site in Chengjiang, China was found in 1912. However, new analysis in the 1980s by Harry B. Whittington, Derek Briggs, Simon Conway Morris, and others sparked a renewed interest and a burst of activity including discovery of an important new fossil site, Sirius Passet, in Greenland, and the publication of a popular and controversial book, Wonderful Life by Stephen Jay Gould in 1989. At times, religious and scientific dogmatism have been reflected in the history of paleontology. Everhart, M. J. 2005. Oceans of Kansas: A Natural History of the Western Interior Sea. Bloomington, IN: Indiana University Press. ISBN 0253345472. Hooke, R. 1665. Micrographia. The Royal Society. Knight, J., and N. Schlager. 2002. Science of Everyday Things. Detroit: Gale Group. ISBN 0787656313. Larson, E. J. 2004. Evolution: The Remarkable History of a Scientific Theory. New York: The Modern Library. ISBN 0679642889. McGowan, C. 2001. The Dragon Seekers. Cambridge, MA: Persus Publishing. ISBN 0738202827. Newman, G. et al. 2001. Echoes From the Past: World History to the 16th Century. Toronto: McGraw-Hill/Ryerson Ltd. ISBN 007088739X. Rudwick, M. J. S. 1997. Georges Cuvier, Fossil Bones, and Geological Catastrophes. Chicago: The University of Chicago Press. ISBN 0226731065. Waggoner, B. 1996. The case of the Irish elk. University of California Museum of Paleontology. Retrieved April 4, 2007. This page was last modified on 11 January 2019, at 19:43.